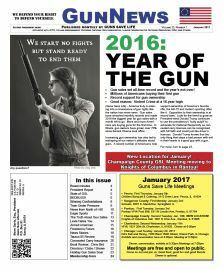 GunNews is our monthly newspaper that contains news, stories, tips, meeting information, product reviews, event listings and more. GunNews has been in publication since 1999. GunNews is available for free at various business newsstands around the state of Illinois but quantities are limited and they go fast. Extra copies are also available at our monthly meeting locations. But Why Wait? When you become a member, you get a copy mailed to your door every month, plus access to current and archive online editions in our members only section.